When the photo of Sophie Power breastfeeding her three-month-old baby at a checkpoint during the 171 kilometre Ultra Trail Mont Blanc race went viral in September, it kicked off a huge conversation about how women juggle various mental and physical demands while striving to compete at high levels athletically. 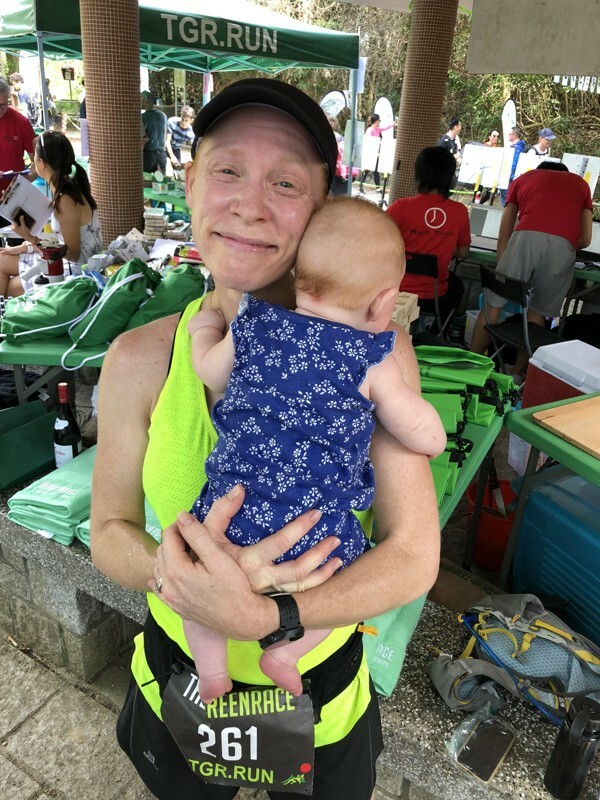 For Wendy Porterfield, a 38-year-old local runner who has called Hong Kong home for the past five and a half years, and a mother to a nine-month-old baby girl, it was also an inspiration to get out on the trails, compete, and work out the logistics of how to pump milk mid-race. “That woman in the article [Sophie Power] said running makes her a better mum. And that’s true for me, too,” said Porterfield, who is originally from Wisconsin, United States. On Saturday, Porterfield will be racing the MSIG HK50, a 50-kilometre trail race that takes competitors from the Peak, along the first half of the Hong Kong trail, teasing them with mostly flat terrain before steep ascents in the second half of the race up Mount Butler, Jardine’s Lookout, and Violet Hill before finishing at Wong Nai Chung Gap Road. This will be Porterfield’s fourth major race since giving birth to her daughter, Ruby, in late January. It will also be her first 50km race. Porterfield is a full-time mother, and doesn’t need to pump regularly on a daily basis because she is at home and can feed Ruby directly. And still it goes on. Because a conversation has been started which we should never allow to stop. That women have the same right to set ourselves goals, to dream and to achieve them. And that does not change when we become mothers - it only burns stronger as we strive to show our daughters and sons what women can do. Thank you to @katherine_m_turner for your beautiful article (link in bio) which puts this into words far better than I ever could. And to @strava for actively standing in our corner. Who will join them? Initially, Porterfield had planned to pump on the move, while she walked up a steep, paved road during the race. On Wednesday morning, she went out on a trail near her home, pump in hand, ready to practice pumping on the go. But with it being the Chung Yeung festival, there were more people on the trail than usual, and the shirt she would be racing in was too tight to fit the pump under. There were just too many people around to yank up her shirt and start pumping, so she pivoted to plan B: taking five to ten minutes at a checkpoint to pump, while giving her legs a short but much-needed break. 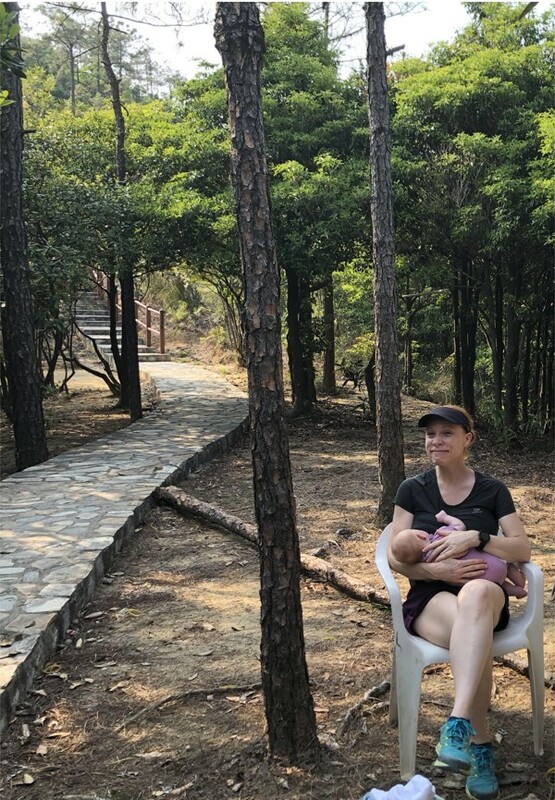 Luckily for Porterfield, there is a strong network of nursing-mother trail runners in Hong Kong she can tap into for tips and support. She listed other local runners like Nia Cooper and Valerie Lagarde who have pumped during long trail races. Cooper, who won the MSIG Sai Kung 50 in February in addition to pumping mid-race, reached out to Porterfield and offered guidance on logistics. She’ll also be there on Saturday to help Porterfield with pumping at one of the checkpoints. “It means a lot to have the support of another nursing momma,” Porterfield said. “I feel like there’s a good little flock of women in Hong Kong these days who are mums and are coming back to racing and are good runners,” she added. And Porterfield isn’t writing off the possibility of pumping while walking in another race. She hopes to find time to practice pumping on the go on a quiet trail in the months to come, and perhaps manage pumping without stopping at a checkpoint in next February’s Fast 50 race, which she is signed up for.